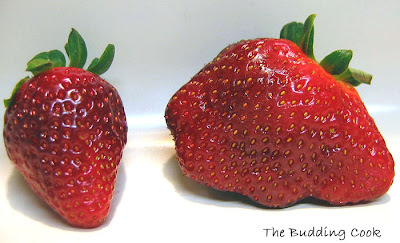 I stumbled across this recipe while I was looking for something simple to do with the strawberries that had just been purchased. I made this last night and it was a huge hit. In a bowl, gently toss the strawberries with the sugar. Let it stand for 15 minutes or so until the strawberries have released their juices. Meanwhile, combine the balsamic vinegar, sugar and lemon juice in a small saucepan. Stir over medium heat until sugar dissolves and the vinegar is reduced to a syrup-like consistency (takes about 5 minutes). Cool. Whip together the mascarpone cheese, sugar and vanilla essence. Portion the strawberries with their juices, mixed with a bit of balsamic syrup into serving bowls. Top with the mascarpone mixture and drizzle with the remaining balsamic syrup. Balsamic vinegar has a lovely sweet flavor with a hint of tartness. Reducing it only intensifies the goodness. The mascarpone, the strawberries and the balsamic vinegar go really well together to make a quick dessert that is absolutely heavenly. Off this goes to Mike @ Mike’s Table for Strawberry Seduction. I decided to have some fun with the balsamic vinegar while putting this together. I clicked a couple of pictures and decided to send this one over to Bee and Jai at Jugalbandi for Click: Metal. Gorgeous dish, am drooling! The entry for click is awesome! Hi TBC...I saw the Click entry & it grabbed me by the eyballs...got here as soon as I could. Lovely lovely click, what a luscious dessrt idea. Hope I can find some balsamic vinegar here. Other option would be to start making my own...hmmmmmm. Beautiful post indeed!! Wow, the scramble looks fabulous. Yummy! Nice click too! What a gorgeous strawberry recipe, tbc. 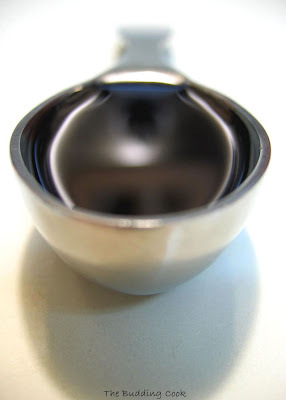 I love the spoonful of balsamic picture too. Fresh strawberries and balsamic vinegar is favoutite combo of mine. I can see how m.cheese can make it even better. Great idea, TBC! No wonder it was such a huge hit! That looks yum! Strawberry & Mascapone Cheese.. perfect together! Oh i have so much catching up to do.... i missed out on so many recipes because of the break... each and every single recipe of yours is so tempting and the pictures are just droolworthy. Congratulations on your awards...you deserve them. I've no doubt this recipe was a huge hit. I'm always impressed with your use of balsamic vinegar! I just finished dinner and wish I could eat this for dessert right now! Oh you made the balsamic strawberries too! Now I'm double inspired from this recipe and your beautiful creations! I also love your grape smoothie too! That's definitely a new one for us! so yummy!!! stupendously brilliant minds obviously think alike. and i *love* that last photo! Thanks for visiting my site. Since I'm into eggless baking, I think I should try this one and your chocolate cake. But I'm skeptical about the balsamic vinegar. I've not tasted it so far, hope I will like it. What a marvel with strawberries....Excellent snaps TBC!! This dessert always tastes and looks sophisticated. I just love mascarpone, even more than heavy whipping cream. Nice touch, TBC. great pic TBC also a great recipe for a quick dessert!! I have already bookmarked it!! The spoonful of vinegar is superbbbb!!! Its an beautiful pic for click. Very nice creativity. I love mascarpone cheese. Nice recipe. Ummmm, what an exotic treat this is. Great photos, and I love balsamic vinegar with strawberries! wonderful recipe and entry for click! its good click ..all the best ..
and the desert looks so mouth watering ...with strawberries ,its definitely an exotic one .. Sorry for not being in touch. Made my trip to India during Dec. Thanks for your New Year Wishes. I was really happy to see your wish. Will come back to see the receipes. Common girl, you are going to spoil our diet by posting these mouthwatering pics!!(;-). I do too. I love the sweet and tangy flavor. Jaya- thank you so much for the ther cooment too. It is most encouraging! Seec- it is so nice to see you here! Hope you will start blogging too when you have the time. You must have had a great time with family and friends in India.I peeked into your other blog too. You've been busy travelling to other places too, u lucky thing! Your pic is much tempt-atious than the original one! wow.. 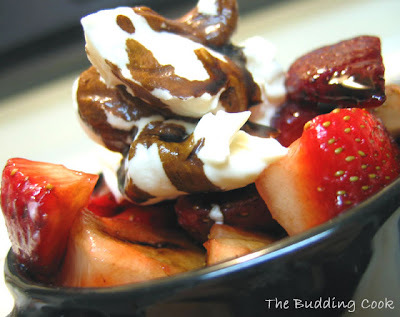 I love the way the balsamic vinegar and the mascarpone cheese pair with the strawberries!